Admission to the parks is free unless otherwise noted. Additional information and park phone numbers can be found on individual park pages. Just click on their links. Several of these parks offer camping as well. Book a camping reservation online, or call 877-565-3600 Monday through Friday, 8 a.m. to 5 p.m. It can get very hot on the park trails, and many don’t have shade. Always hike with appropriate footwear, dress in layers, wear sunscreen and a hat, and bring plenty of water. A gorgeous setting encompassing 88 acres, El Monte County Park is one of the original San Diego County Parks properties. 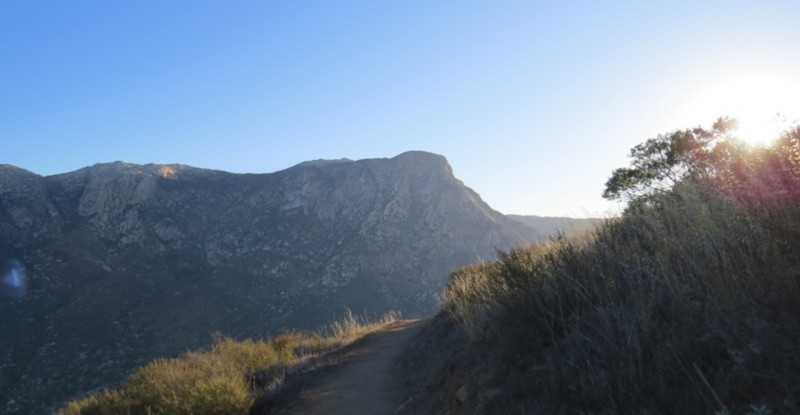 The spectacular rocky face of El Cajon Mountain stands high over this popular picnic destination where recreational opportunities, including hiking, abound! Travel up the hillside on the Historic Flume Trail, to view remnants of early water transportation. 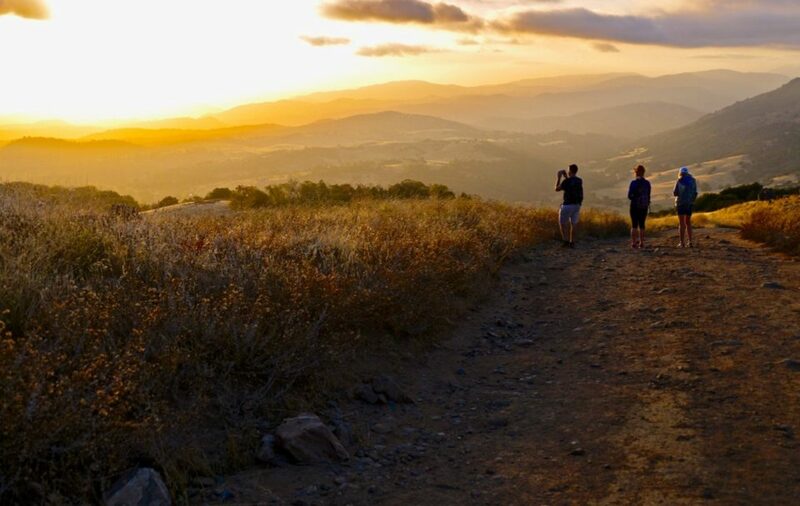 Or drive a mile west to a second property managed by the El Monte County Park team – the Helix Flume Trail – where more remnants are found, along with exceptional views. Day-use parking is $3 at the main park. 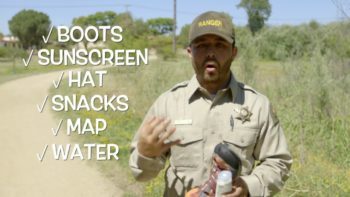 Hellhole Canyon County Preserve is a 1,907-acre preserve that offers 13.5 miles of moderate-to-advanced trail opportunities. The Hell Creek Trail descends from the staging area to the riparian zone along Hell Creek. Along the creek bed, hikers will find a reprieve from the sun under mature sycamore and oak trees. The trails beyond Hell Creek can be more challenging as they rise out of the creek bed into a chaparral environment and continue up Rodriguez Mountain. But the effort pays off. On a clear day, you can see the Pacific Ocean from the top. And if you visit in the spring, you may catch a glimpse of this floral phenomenon! Take this hike on a cooler day—it gets hot in Hellhole. The preserve is closed in August due to extreme heat. 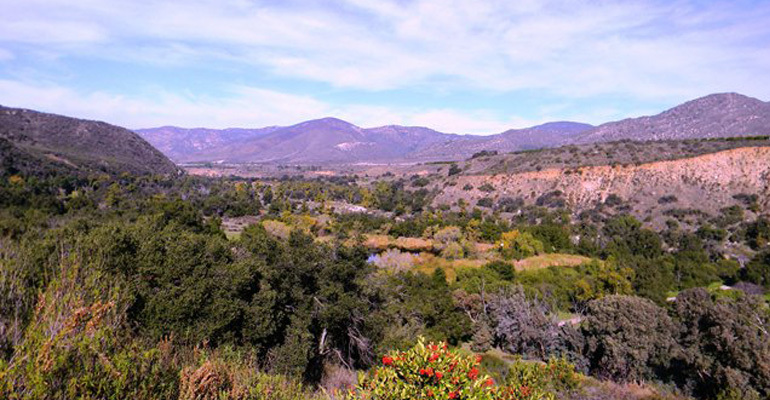 Sycamore Canyon Preserve consists of 2,272 acres of coastal sage scrub and chaparral-covered hills including the 325-acre Goodan Ranch, a mix of grassland, riparian, coastal sage, oak woodland and mixed chaparral. More than 10 miles of trails for hiking, biking and equestrian use lead to grand vistas, abundant wildlife and interesting reminders of human use, centuries ago. A must-try tail is Martha’s Grove, where you can choose your own adventure as the path splinters in several directions. The preserve includes the Goodan Ranch Center, which was built next to the original ranch house that was burned during the 2003 Cedar Fire. Come for a hike and stay to play. Stelzer County Park contains several miles of multi-use trails, TRACK Trails for kids, exercise equipment, playgrounds, a horseshoe pit, barbecues and plenty of picnic tables beneath a thick canopy of trees. Parallel to Wildcat Canyon Creek along the western bank, find the 0.7 mile Riparian Trail that wanders through a fresh water habitat and is home to a variety of native plants and wildlife including deer, raccoons and bobcats. The 0.6-mile Stelzer Ridge Trail begins past the western playground just south of the giant live oak tree. 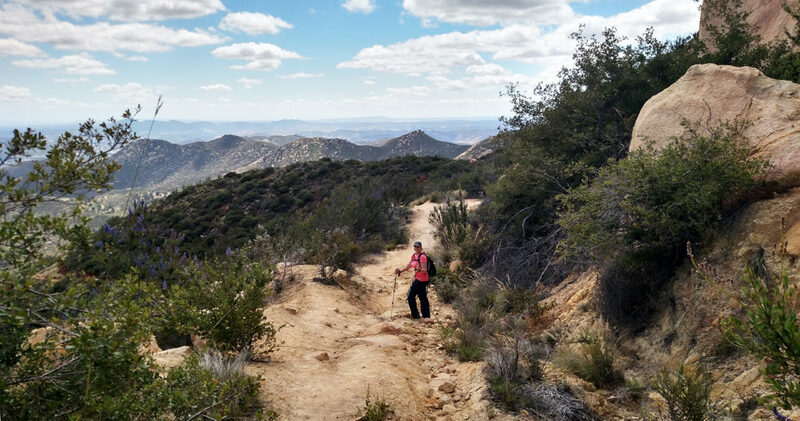 Beautiful views of mountains to the east and valleys down below will follow you as you make your way to the Kumeyaay Promontory, where you can take a left for a rigorous climb to the summit. The 0.28-mile Wooten Loop Trail connects the Riparian and Stelzer Ridge Trails. In the spring, you will encounter the vibrant colors of wildflowers in the meadows along the way. Enjoy the refreshing breeze at the observation deck while searching the skies for birds of prey. 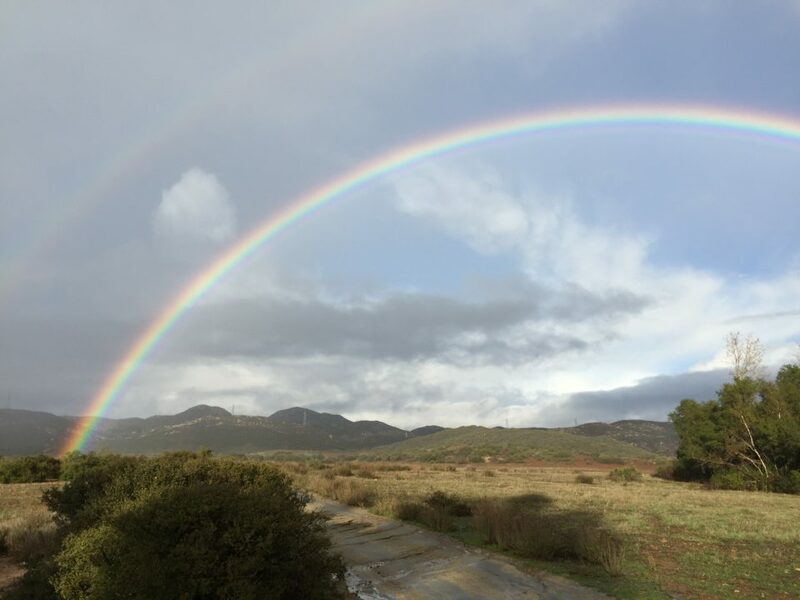 Located in the picturesque San Luis Rey River watershed, the preserve offers more than 4 miles of easy to moderate hiking trails and is known as a birdwatcher’s paradise. The main trail is the most popular, and provides access to the preserve’s interior. The Alice Fries Trail is a half mile single-track trail that meanders near the San Luis Rey River. The Upper Meadow Trail provides a wonderful overview of the Preserve and San Luis Rey River corridor. Step into the on-site visitor center to learn more about the preserve’s colorful past. The preserve is closed in August due to extreme heat. Volcan Mountain County Preserve offers approximately 2,900 acres of mixed conifer forest. Hike to the summit for spectacular views from the desert to the coast. This roughly 5-mile round-trip, out-and-back hike is considered moderately difficult, with steep inclines. The trail gains more than 1,200 feet to the summit. Park on Farmer Road and head to the Hubbell Gate. 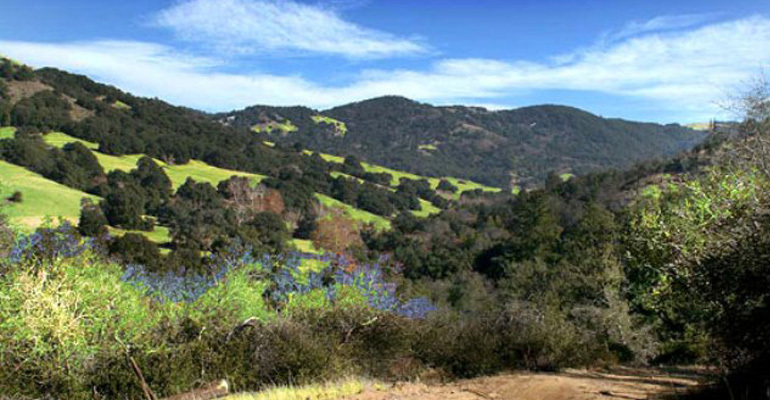 Get away from it all at Santa Ysabel Preserves. Split into a West Preserve and East Preserve, Santa Ysabel is 3,800-acres of oak woodlands, native grasslands and fields of wildflowers. Hikers, cyclists, and equestrians can enjoy 18.5 miles of trails through the preserves including two loops that traverse through the unique habitats. Start with the 4 miles of trails on the West side before building up your stamina to take on the 13 miles on the East. 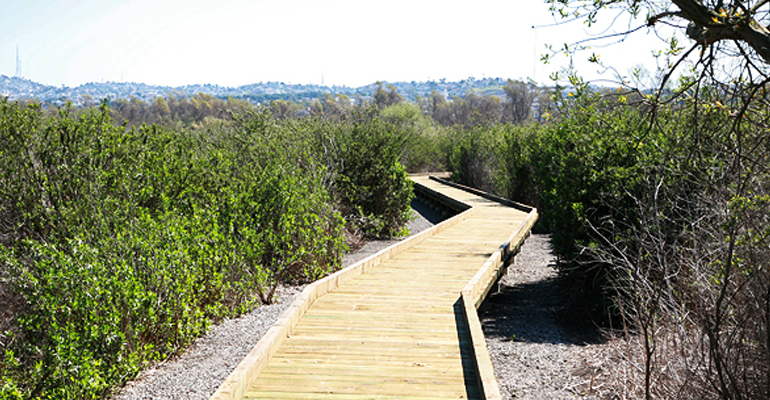 Tijuana River Valley Regional Park offers more than 1,800 acres of diverse habitats. Experience the extensive system of trails that link the many habitats in this fertile river valley. You can hike, mountain bike and ride horseback along 22.5 miles of multi-use trails – or bring your binoculars to track some of the 340 native and travelling bird species at a park that sits beneath the Pacific Flyway. Start with the picturesque 1-mile Dairy Mart Loop Trail, which is tailor-made for bird watching and even features a bird blind. Next head over to the Bird and Butterfly Garden, also west of the Visitor Center, located at 2310 Hollister Street. Walking paths meander around plants specially chosen to attract these beautiful winged creatures. 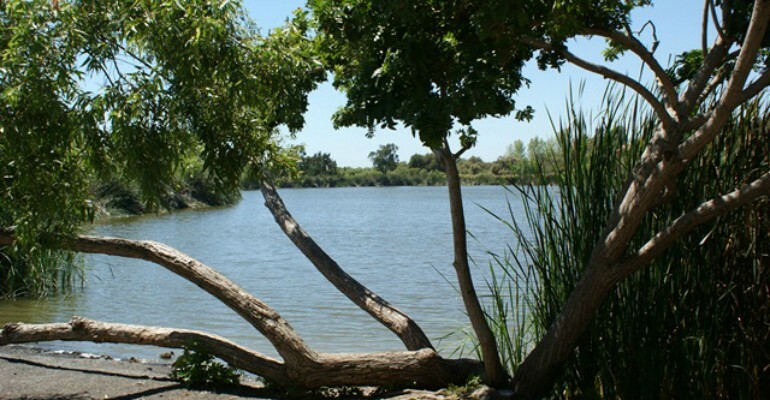 Lake Morena County Park is a camping, fishing and hiking oasis in east San Diego County. 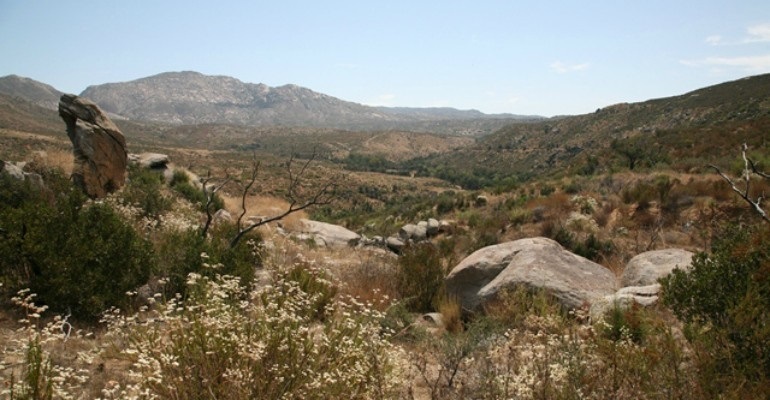 Because of its location – southwest of the Laguna Mountains – the park shows characteristics of desert, coastal, and mountain habitats. It is the most remote reservoir in all of San Diego County. 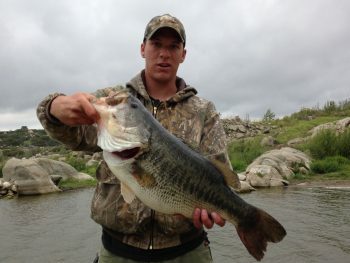 It’s a popular vacation spot for several reasons: It’s a hop, skip and jump away from the well-known Pacific Crest Trail (PCT), the lake is regularly stocked with a variety of freshwater fish, and it has camping. Plus, there’s ample day-use picnic areas. 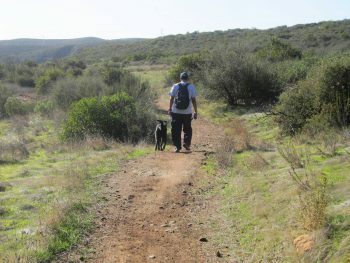 Try the PCT from Lake Morena or hike to the Morena Butte Trail near the boat launch area of the park. 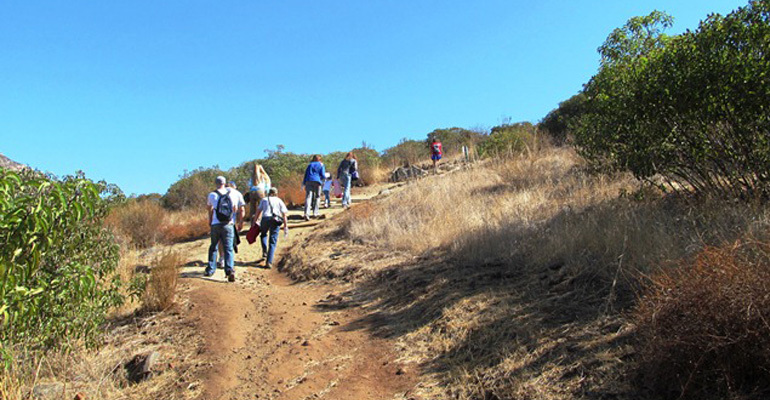 The Morena Butte Trail connects to the 2.6-mile Hidden Cove Trail that’s an out-and-back to the dam and climbs to the hilltop to views of the dam below. 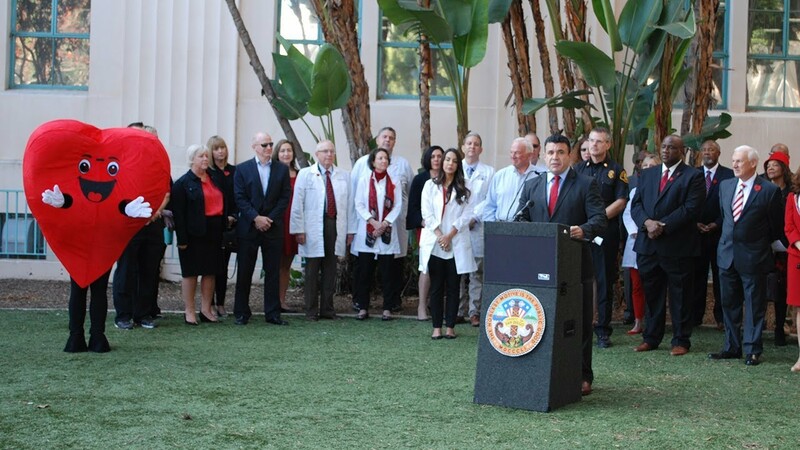 Just 8 miles from the Pacific Ocean in Oceanside, Guajome Regional Park is a great place to visit year-round. Some 4.5 miles of trails meander through diverse Southern California habitats such as woodlands, chaparral, wetlands and mixed grasslands. Two ponds attract migratory birds and serve as home to a variety of fish species. 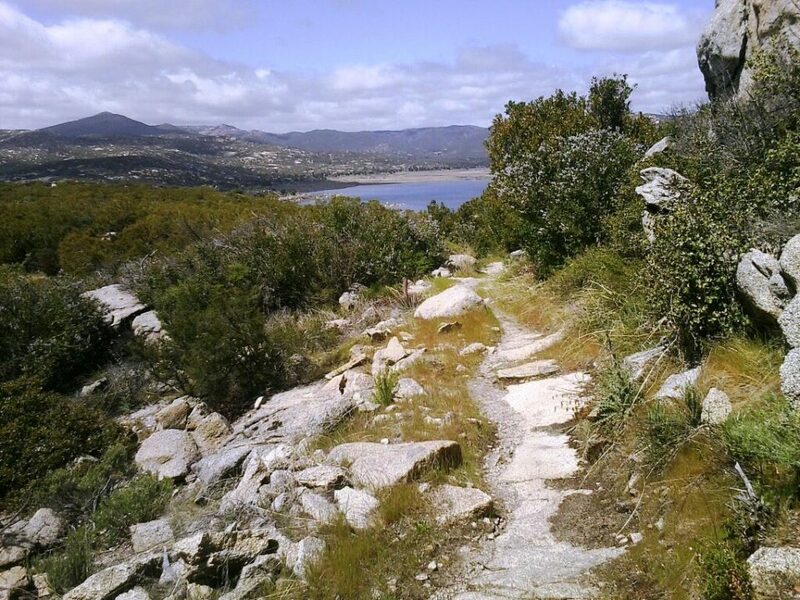 Guajome has a trio of trails to try: the Summit, Willow and Upper Pond trails. All three trails are easy for both beginners and seasoned hikers wishing to taken advantage of a scenic stroll. Plus, the park has playgrounds, a basketball court and lots of green lawn space, which make this park ideal for picnicking – along with 33 tent and RV campsites and a rustic cabin for those wishing to extend their stay overnight. Take this information with you. Download the Easy2Hike app to find information on these parks and more.